Most items in stock! Standard steel Lyon lockers are the solution to all your school locker needs. Lyon has long been America’s leading manufacturer of a complete line of quality lockers and accessories for education, hospitals, and industry. 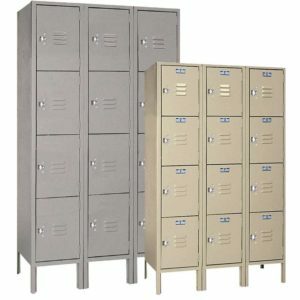 These metal lockers are perfect for either middle school or high school. Also a great fit for gym locker rooms too. We have a huge selection of tiers and sizes as well as 1 wide and 3 wide lockers. Lyon lockers have recessed lift handles or pull handles, both of which take a padlock. A secure latching system that increases the protection against break-ins compared to other school locker latching systems. All door frame corners are lapped and welded to form a strong, rigid assembly. All one piece locker door construction from prime, high grade class 1, 16 gauge steel for extra strength and durability. One piece, top-to-bottom 16 gauge steel door strike on all lockers for strength and security. We install soft rubber bumpers, at door jamb locations, to cushion door slams which is great for smooth, quiet use in school. Also Lyon steel gym lockers and school lockers for sale have louvers for ventilation. Combo and key locks can be purchased that can be built in to the locker. We offer our lockers either unassembled or assembled. Lyon standard metal lockers come in dove gray or putty. These are our standard powder coat paint finishes. Lyon makes their standard steel school locker in the USA. They are also GREENGUARD certified. Looking for other lockers? Check out Lyon’s full line of lockers.